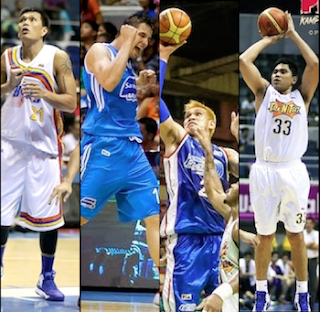 A new PBA season is upon us, and with it comes renewed passion for the game all Pinoys love. Over the offseason, I have come to wonder about one thing – who are the best pro players we have right now? It’s a question that has been asked and answered many times already -- by many people, in many different times, in many different places, and using many different metrics (or no metrics at all). Here’s my feeble take on the whole thing – a three-part series revolving around the best performers of the past season and how they might do in this new one. In this first part, I will focus on the big men of the PBA. These are the guys who play either/both power forward and/or center for their respective teams. Something I found difficult to do was try and differentiate between pure Cs and PFs simply because many pros play both positions. Some are big enough to be centers, but have power forward skills. Some are too small to be centers, but have never played any other position in their lives. Please take note that this list is based purely on the Efficiency Ratings for the entire 2012-2013 PBA season as calculated by PBA-Online.net. I have neither the software nor the patience to do all the friggin’ calculations myself, so there. Are they among the top big men in the PBA? - The Reedley College alum probably would have been a Rookie-of-the-Year frontrunner had he been in any other rookie class, but he was part of this one that had, among others, Calvin Abueva and June Mar Fajardo. His best conference was the Govs’ Cup, where he showed marked improvement in terms of long range shooting. Hodge has enough size to be a solid PF, and he has been working on his perimeter skills to be able to pinch-hit at SF, too. When he entered the PBA, he was basically just a kid with a lot of swagger and awesome hops, but he has already grown to become a potentially dominant player at the 4 spot for the Bolts. - Cruz is maybe the epitome of the small big man. Given his mobility and skill-set, he is the perfect small-ball center, which is actually a role he has played many times for the guard-heavy Elasto-Painters. In the previous season, Cruz was particularly impressive in the Philippine Cup, where he was in the league’s top ten most efficient players BAR NONE. His numbers dipped a little bit as the season wore on, but he still had some shining moments. As of this writing, it looks like the former King Tiger might have another strong Philippine Cup showing, especially after he netted a double-double in ROS’s win over Alaska this past weekend. - Kelly struggled mightily this past season when it came to his health, but, despite that, he was still definitely one of the league’s best forwards. He is maybe the league standard when it comes to possessing a combination of size, strength, mobility, and athleticism, and I am all too happy he will get to showcase his wares anew. In the Texters’ opening day win over the Bolts this past weekend, the man called “Machine Gun” didn’t disappoint with 10 points, 5 assists, 3 rebounds, 2 steals, and a blocked shot. Looks like Kelly is locked and loaded . - The 2009 top overall pick has had a slew of much-publicized struggles in the PBA. His production both in the previous season and for Gilas-Pilipinas in the 2013 FIBA Asia tournament, however, gave us all a glimpse of just how good the Ateneo/Western Kentucky product can be. In addition, it seems that, based on opening weekend, Aguilar is really raring to breakout in this conference. Even with the inclusion of another marquee big man (Greg Slaughter) in Ginebra’s lineup, Aguilar posted eye-catching stats against the Mixers – 18 points, 8 rebounds, 5 blocks, and 1 steal. He shot just 4/11 from the field, but he compensated by being aggressive and making 10 of his 13 free throws. - Thoss, despite not making the cut for the final Gilas roster, had a banner season in 2012-2013. In spite of his playing time and most of his numbers going down, he was able to lead the Aces in bagging the 2013 Commish Cup title, winning the Finals MVP along the way. The James Cook University alum averaged 13.7 points and 10 rebounds in the three Finals games, all of which were won by Alaska. More importantly, though, he limited the Gin Kings’ import, Vernon Macklin, to just 36 points total in the Finals. With the influx of a handful of young, quality big men in the PBA, look for Thoss to continue raising his game in an effort to remain one of the country’s top-shelf big men. - There are two things that makes Hugnatan’s production this past season quite remarkable – he is already 35 years old and, at 6’4, he is terribly undersized at center. Hugnatan is a natural power forward, but, like Jervy Cruz, he has to play much bigger foes at the slot because, well, the Meralco Bolts just don’t really have anyone else. Hugnatan didn’t do too shabbily, though, as his numbers prove. He was also one of the league’s most durable guys, playing 47 games last season and averaging nearly 28 minutes per outing – the most since his sophomore season. Age might finally be catching up with him, though, as he produced just 7 points and 6 rebounds in Meralco’s opening weekend. Take note, however, that he played FORTY minutes. - RDO was one of the heroes of Gilas Pilipinas’s FIBA Asia campaign, frequently outmaneuvering and outshooting bigger and younger opponents, but he was also one of the best big men in the PBA’s 2012-2013 season. A lot of people might have already forgotten, but RaniDirk was actually the Finals MVP of the 2012-2013 Philippine Cup as TNT swept Rain or Shine, 4-0. In that pivotal series, the former St. Francis of Assisi cager normed about 18 points, 8 rebounds, and 3 assists per game. He also shot about 42% from beyond the arc, and made a total of 13 treys in those four games. He skipped the Texters’ opening day game against the Bolts, but expect him to continue as one of the nation’s best PFs this season. - What I love about the 2006 PBA Most Improved Player is the fact the he basically outworks anybody he goes up against. What he lacks in size and finesse, he more than makes up for in raw strength, mobility, tenacity, and timing (remember that undergoal stab against Korea that iced the semis win for Gilas?). 2012-2013 was also a big year for the former PSBA and FEU player. Pingris became part of the season’s Mythical Second Team and its All-Defensive Team, and then named the league’s Defensive Player of the Year and the MVP of the Govs’ Cup Finals. He was outplayed by Japeth Aguilar and Greg Slaughter in the Mixers’ first game this season, but he is still a smart bet as one of the PBA’s best bigs when all the dust finally settles. - Not a few scoffed when the Pampanga native won the league’s season MVP award about a month ago, but a look at his numbers proves he was, in fact, quite deserving of the accolade. Yes, the Boosters didn’t win any of the conference titles, and, yes, they underachieved overall, but Santos was still, again based on the numbers, one of the best players in the league. Among the creamiest of the cream of the crop, one might say. I mean, this is a guy who does just so many things for Petron. He is mobile enough to play 3 and big enough to play either of the frontline spots. He is athletic as hell, and has an uncanny nose for the ball. It is worth noting, however, that his scoring and blocks this past season are both career-lows, which might indicate a further downward trend in his production. Consequently, this might point to his not being an MVP favorite this season. - Here’s the thing – Fajardo is ahead of last season’s MVP by more than 2 quality points in terms of efficiency, and he is also ahead of last season’s ROY by nearly as much. Despite these metrics, however, he is neither the league’s MVP nor its ROY. He was named, though, as part of the All-Rookie First Team and the league’s overall Mythical Second Team – both of which are awesome neophyte achievements and augur well for his future in Philippine basketball. The Kracken had a relatively slow start to the entire season as he tried to get used to the physicality and the pace, but once he got his bearings, he was quite unstoppable. I mean, this is a guy who would’ve been the obvious choice for Finals MVP had Petron won the Govs’ Cup. He is that good, and we’re all fortunate enough to see just how awesome he will be this season even as the entry of Greg Slaughter, Ian Sangalang, and Raymond Almazan should up the ante for the league’s promising young big men. Fajardo might even be a leading MVP candidate when all is said and done. Belga normed just 6.8ppg and 5.9rpg. His EFF was 21.43 only. He was ranked 48th overall, right behind Allein Maliksi, Larry Rodriguez, and Mick Pennisi. Lol. We all know that belga's a better player than some of the guys in the list.